This is probably the most “cheaterbug” cream cheese brownies I’ve ever made. 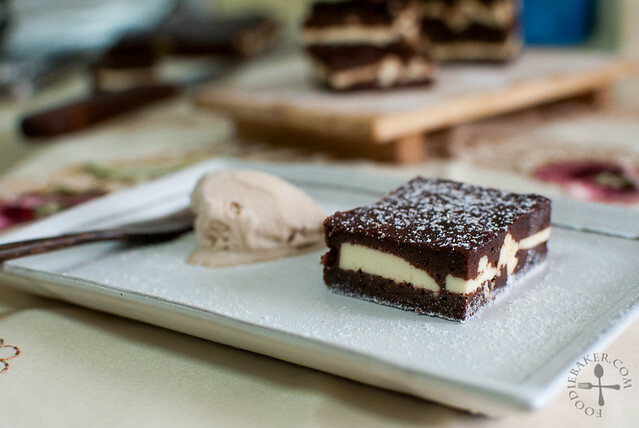 I love the fact that I don’t have to make 2 batters – just one chocolate brownie batter, with delicious and rich cream cheese slices sandwiched in the middle. Pure indulgence! The only thing is that I found the brownies a tad too flat, I wish it had a more chocolate to cheese ratio… I used egg whites instead of whole eggs as I want to use up the egg whites, just like my egg white brownies. I love the brownies when they are very chilled! It’s also a lot easier to slice them when they are chilled. 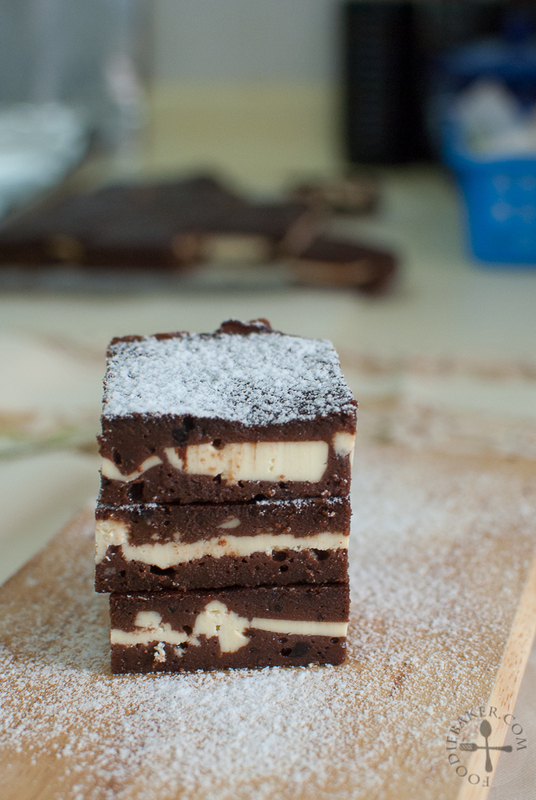 Give this recipe a try if you are craving for some delicious chocolate and cheese combination~! 1) Melt chocolate and butter. 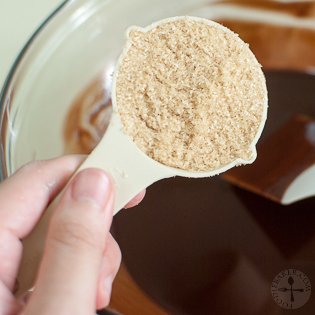 2) Stir in brown sugar. 3) And caster sugar. 4) Followed by some vanilla. 5) Whisk in the egg whites. 6) Stir in the dry ingredients. 7) Spread 1/2 of the batter into a tin. 8) Top with thin cream cheese slices. 9) Pour the remaining batter on top. 10) Bake away! Serve with some ice cream – my ice cream is melting way too fast! I’m submitting this to Bake-Along hosted by Zoe from Bake for Happy Kids, Joyce from Kitchen Flavours and Lena from Her Frozen Wings! 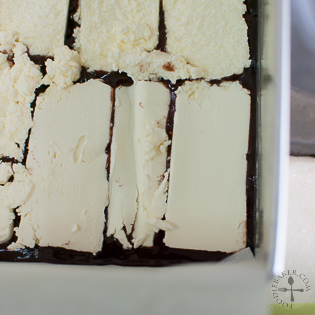 The roundup will be at the end of the recipe, click to see what their versions of this cream cheese brownies! 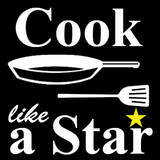 I’m also submitting this to Cook Like A Star (2nd anniversary special! ), hosted by Zoe from Bake for Happy Kids, Joyce from Kitchen Flavours and Mich from Piece of Cake! Preheat the oven to 175 degrees Celsius. 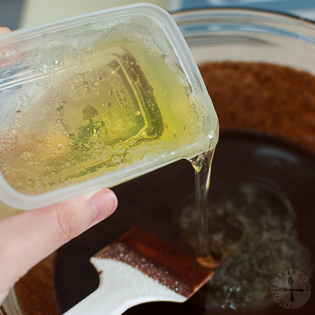 Grease the bottom and sides of an 8x8-inch baking tin and line with baking parchment, leaving an overhang so that it is easier to lift out the brownie when it has cooled. 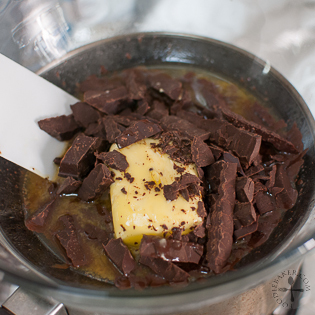 Melt the chocolate and butter in a double boiler. Set aside for 10 to 15 minutes to let the mixture cool slightly. 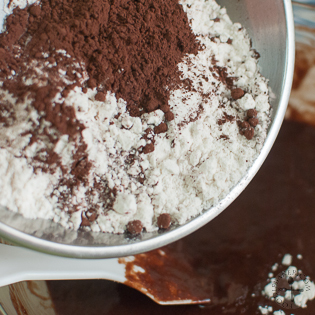 Whisk in the sugar, vanilla and egg whites then stir in the flour, cocoa powder and salt. Spread half of the batter evenly on the baking tin. Place the cream cheese slices on top of the batter, arranging the slices as close to each other as possible. Spread the remaining batter over the cream cheese slices. 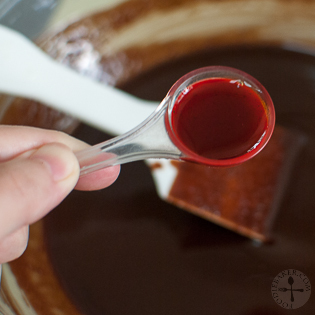 Bake for 15 to 20 minutes until the top is dry but a skewer inserted into the centre of the cake comes out damp. 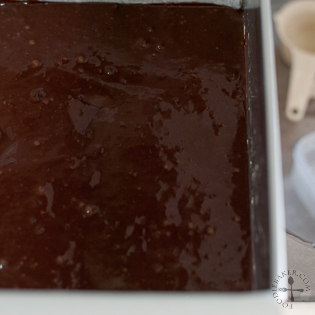 Set the tin on top of a wire rack and let the brownies cool completely in the tin. 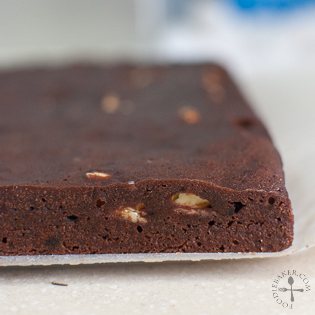 Lift out the brownies using the baking parchment overhang, though it's a lot easier to lift out if the brownies are chilled first in the refrigerator. 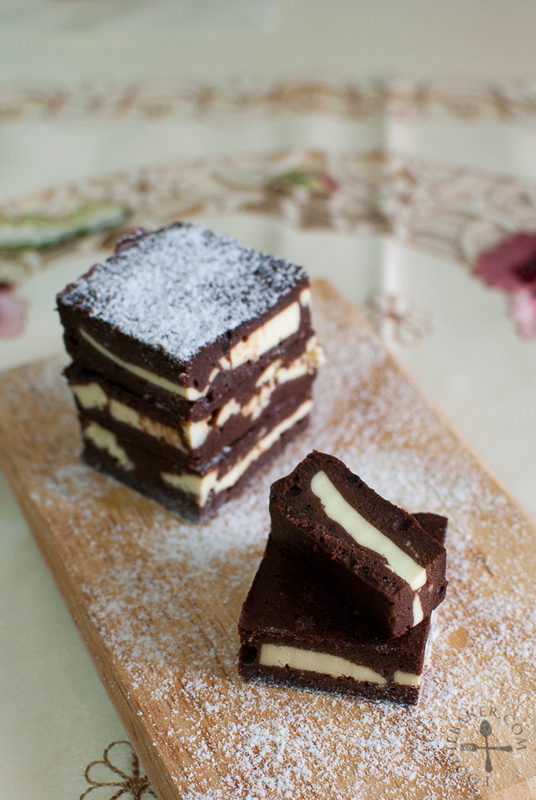 Slice the brownie into 16 slices, dust with icing sugar and serve. 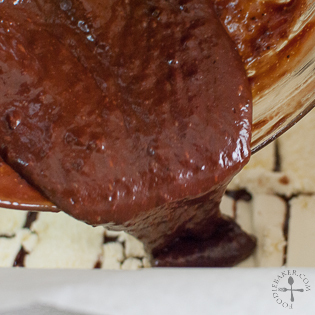 Place the chopped chocolate and butter in a heatproof bowl. If you chop the chocolate finely and relatively of the same size, it will melt faster and evenly. Grab a pot – small enough such that when the heatproof bowl is set nice and snug on top of it, with the bottom of the heatproof bowl still at least 2 inches away from the bottom of the pot. Pour about 1-inch tall of water into the pot and bring it to a boil. Turn the heat down to a simmer and set the heatproof bowl on top. 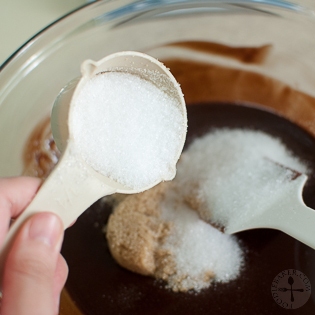 Stir the chocolate and butter frequently until all the chocolate has melted. Remove the bowl from heat and continue stirring until all the butter has melted. Set aside and let cool slightly before continuing with the recipe. Look at those, that filling is so inviting. Got to try this one out! I can see that your brownies has the “army” sort of camouflage topo look! I have to say this recipe is pretty cool! Cheesy and delicious I’m sure. hi jasline, sorry for not dropping by for a while. Nice to see your profile pic here. I didnt hv a chance to taste these brownies cold as i just made a small recipe and finished them on the 2nd day..and you are right, this recipe is simpler compared to other cream cheese brownies, cheat version! haha..thx for baking along yaa! Yes, I do agree these brownies are a little flat! Did not eat this cold from the fridge as we finished it all up the next day, did not refrigerate them, so no idea whether is it better warm or cold. Hi Jasline, I see most of us has very short brownies….slightly comforted lol! I prefer these when warm as I find it too dense when cold…I guess with ice-cream would be more delicious.